Base damage decreased from 70/115/160/205/250 to 60/105/150/195/240. Counter for Gatling Gun stacks now resets 4 seconds after the enemy stops getting hit by it, increased from 2. Attack Speed buff increased from 10/13/16/19/22% to 15/17.5/20/22.5/25%. Base shield strength decreased from 80/110/140/170/200 to 70/100/130/160/190. Base damage increased from 70/95/120/145/170 to 70/100/130/160/190. Mana cost decreased from 80 at all ranks to 60/65/70/75/80. Pouncing on a target afflicted by Hunt will no longer put Pounce on a 3-second-cooldown; instead, it will slow the target by 50% for 0.5 seconds. Fury-per-second increased from 5 to 6. Base Health-per-second decreased from 2 to 1.7. Base Armor increased from 27.6 to 28. Fury generation changed from 1/2/3 per 1.5 seconds to 1/1.5/2 per second. Damage increased from 60/90/120/150/180 [+0.55 AP] to 60/95/130/165/200 [+0.6 AP]. No idea how you can get these yet; stay tuned! Auto-attack range decreased from 175 to 125. Cooldown increased from 16/14/12/10/8 seconds to 18/16/14/12/10. Attack Speed-per-level decreased from 3.3% to 1.5%. Second shot will no longer be able to crit. All changes from this PBE update have been reverted. AP ratio increased from 0.7 to 0.8. AP ratio increased from 0.4 to 0.5. Now additionally grants 10 Mana-per-5. No longer grants 250 Mana. Now heals allies for 33% of the healâ€™s original value, decreased from 50%. Bonus health gained per stack increased from 90/120/150 to 100/140/180. Movement Speed buff increased from 40/50/60/80% (values for levels 1/6/11/16) toÂ 50/60/70/80%. Cooldown decreasedÂ from 13/11.5/10/8.5/7 seconds to 11/10/9/8/7. True damage on Vitals changed from 3% [+ 2.8 – 4.5% of Bonus AD] to 2% [+4% of Bonus AD]. Slow strength decreasedÂ from 40/45/50/55/60% to 30% at all ranks. Bonus AD while shield is active decreased from 14/23/32/41/50 to 10/17.5/25/32.5/40. Knockback duration decreased from 0.75 seconds to 0.5. Mana cost decreasedÂ from 40/45/50/55/60/65Â to 40 at all ranks. Attack speed decreasedÂ from 0.695 [+3% per level] to 0.65 [+2.5% per level]. Ghosts now do 3 laps before disappearing, decreased from 7. Cast range decreased from 1400 to 1000. Bonus to shield increasedÂ from 30/90/150/210 [+0.3 AP] toÂ 30/100/170/240Â [+0.6 AP]. Cooldown decreased from 3.5 seconds at all ranks to 3. Cooldown decreased from 10 seconds at all ranks to 9. Duration of speed buff decreasedÂ from 3/3.5/4/4.5/5 seconds toÂ 3/3.25/3.5/3.75/4. The staff projectile now travels slower away from Lux and faster toward her. Magic Resist increased from 30 [+0 per level] to 32 [+1.25 per level]. Duration of saplings increased from 35 seconds at all ranks toÂ 40/45/50/55/60. True damage on active changed fromÂ 10/15/20/25/30 [+0.1/0.125/0.15/0.175/0.2 Total AD] toÂ 12/19/26/33/40 [+0.25 Bonus AD]. â€œHuntâ€ debuff noÂ longer roots jungle monsters. Mana cost decreased from 50 at all ranks to 30/35/40/45/50. Cooldown increasedÂ from 11/10/9/8/7 secondsÂ to 11/10.5/10/9.5/9. Total AD ratio on second hit decreased from 0.8/0.85/0.9/0.95/1.0 to 0.4/0.55/0.7/0.85/1.0. No longer deals 20% increased damage to jungle monsters. Base damage on proc decreased from 80 to 60. Recipe changed fromÂ Â Pickaxe [875 Gold] + Â Rejuvenation Bead [150 Gold] + 175 Recipe Cost to 2 x Â Long Sword [350 Gold] + Rejuvenation Bead + 350 Recipe Cost (total cost unchanged). Now once again has the passive cleave on-hit. Void Gates now always take 5 hits to kill, but will regenerate their hit points outside combat. Three stars constantly orbit Aurelion Sol, dealing magic damage and applying spell effects to enemies they strike. Aurelion Sol fires the core of a newborn star in a target direction that explodesâ€”dealing damage and stunning all nearby enemiesâ€”upon reactivation or once it travels beyond his starsâ€™ maximum orbital range. Aurelion Sol can travel alongside Starsurge, and by keeping it close heâ€™ll nurture it, growing it in size so that it damages and stuns a wider area when it explodes. Aurelion Sol pushes his stars out to his outer ring, significantly increasing their power. Celestial Expansion costs mana to cast and drains mana every second the ability is toggled on. Once he toggles the ability off or runs out of mana, Aurelion Sol pulls his stars back. Passive: Aurelion Sol builds up increasing movement speed as he travels continuously in the same direction, and loses speed on sharp turns. Some of this speed is stored away as Escape Velocity stacks, which are lost entirely whenever he takes damage from an enemy. Active: Once Aurelion Sol maxes his Escape Velocity stacks, he can activate Comet of Legend to pull in his orbiting stars and take flight, traversing over terrain for a long distance. He cannot turn once his course is set, and enemy damage will bring Aurelion Sol back to earth, restoring his orbiting stars. Aurelion Sol shoots out a long wave of starfire in a target direction that damages and slows all struck enemies. Nearby enemies caught in the blast are also knocked back to Aurelion Solâ€™s outer ring. Ashen Lord Aurelion Sol will be available in store for 1350 RP. 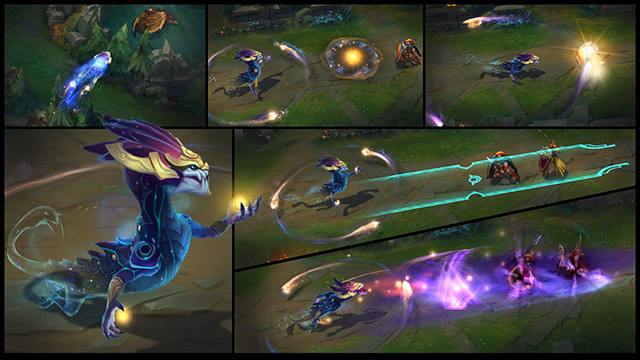 Definitely Not Vel’KozÂ will be available in store for 750 RP. Draven DravenÂ will be available in store for 750 RP. Meowkai will be available in store for 1350 RP. Â Urf KenchÂ will be available in store for 750 RP. Mana cost increased fromÂ 50/60/70/80/90Â to 50/65/80/95/110. Duration of speed buff increased fromÂ 2/2.5/3 seconds to 3 at all levels (slow duration unchanged). [ Note ] Lux’s shield value was decreased inÂ yesterday’s PBE update. No longer resets Nidalee’s auto attack timer. You can find a preview of the skin HERE. I don’t believe Kindred being delayed will affect the timing on the next champion, that’ll be determined by when that champion’s ready and what other stuff’s ready for release around the same time. An issue where it was possible for Wolf to despawn after E casts until you died and respawned. When creating the skin, we went in creating Victorious Sivir knowing that Warden Sivir was already part of Sivir’s skin catalog. That said, we did take precautions to ensure the Victorious skin wasn’t a replica of the Warden skin. Unfortunately, I can’t share too many details about what Victorious Sivir looks like, but she’ll be making her way to PBE before she hits live, and I’d be happy to hear your feedback then! Worlds is in Europe, so Worlds takes place at times that are appropriate for the people and venues in Europe. Same approach as when Worlds was previously hosted in Korea and North America. Not 100% certain sorry, I’m not involved myself in any of the Esports organizational work. I’d imagine it is to leave sufficient time for tiebreakers at least in part though, unlikely though it be when there’s the possibility you need to fit a few extra games into the day you need to account for that. We were previously looking to do work on both Shyvana and Olaf in the preseason. We came to the conclusion both were in fairly reasonable spots though and that we’d be better off putting that time into other champions instead, at least for now. Doesn’t seem excessively strong in pro play, is looking like he might be too strong in regular play though. Suspect we’ll have to nerf him at some point soonish as a result if that trend continues, though we don’t have plans lined up just yet at least. We don’t have a Shaco rework in progress at the moment, or one scheduled. We did have some opportunistic, experimental work being done a couple of years ago, that didn’t hit the mark however so it got shelved. As far as your suggestions below go adding a visible timer for Shaco to the clone seems like a good and easy to implement idea, I’ll pass that one on tomorrow, see if there’s anything stopping us throwing it into an upcoming patch. Changes to things like spell effect application, fear behavior, monster blind etc by contrast are still reasonable suggestions, but things that would need to be part of a larger piece of work which at least at the moment we’re not in a position to prioritize (primary focus right now’s on preseason stuff). Also some game health issues with Shaco we’d need to work on, or conclude were acceptable costs, before we’d be happy adding any power to him. Hmm, there are some technical issues that make duplicating all the buffs and debuffs from Shaco on the clone tricky. Special casing the appearance of red, blue and baron buff’s should be pretty straightforward though. I’ll look into that, and see what’s up with the Hallucination buff if that’s showing up (can’t see a reason it should). Facing giving away which is which is also something it should be possible to at least improve too. Nothing planned, far as I know we haven’t seen anything to indicate he’s out of line at present either. Marksmen changes (both kits and items) will be coming in the preseason (at least a couple of patches after 5.20). We’re not quite ready to talk about all the details of that yet, still sorting out exactly what will and won’t be included. At a guess we should be ready to share details just after Worlds finishes, possibly slightly before. Some things will ship in the preseason. Some things will prove to be good ideas that need more time, so they’ll get delayed. Some things won’t work out as hoped and will get scrapped. This will be gameplay driven updates. There’ll be a few visual modifications to support kit changes, but nothing that qualifies as a visual upgrade. Think the same sort of levels of art adjustments as the juggernaut changes in 5.16. Butcher’s Bridge – New ARAM Map, will likely be enabled together with Gangplank’s rework. You can find a preview of it HERE. Tahm Kench is a new champion. He’ll be available for 7800 IP/975 RP after Patch 5.13 hits live. You can check out his official reveal HERE. For his recall, Tahm Kench takes his hat off and bows. Tahm Kench’s basic attacks and abilities on enemy champions build stacks. At three stacks,Â his abilities have additional effects. Tahm Kench lashes out his tongue, dealing 80/115/150/185/220 [+0.7 AP]Â magic damage to the first enemy hit and slowing them by 50/55/60/65/70%Â for 2 seconds. If the target has 3 stacks of Tahm Kench’s passive, it will instead be stunned for 1.5 seconds. If Devour [ W ] is cast while the tongue is still travelling, the spell will devour the first minion or monster hit. Devours a target enemy for 4/4.5/5/5.5/6 seconds (halved duration for enemy Champions), dealingÂ 20/23/26/29/32% [+2% per 100 AP] of their maximum Health as magic damage.Â Maximum damage to monsters isÂ capped at 400/450/500/550/600. If cast on an allied champion, Tahm Kench gains 30/35/40/45/50%Â bonus Movement Speed while holding that champion and moving towards an enemy champion.Â Tahm gains half the movespeed value if heâ€™s notÂ moving toward an enemy champion, or 15/17.5/20/22.5/25%. If cast on a minion or monster, Tahm Kench can reactive the spell to spit them out, dealingÂ 100/150/200/250/300 [+ 0.6 AP] magic damage to all target hit. Enemy champions can only be devoured when Tahm Kench has 3 stacks of his passive on them and he is slowed by 95% for the duration of the spell. Passive: If Thick Skin is not on cooldown, any damage Tahm Kench takes fills up a gray health bar. If the bar starts decaying, it will start healing him. Active: Converts Tahm Kench’s gray health bar to a shield that lasts 6 seconds. The shield loses value over the duration. Passive: Tahm Kench’s basic attacks and damage spells deal an additional 20 + 4/5/6% of Tahm Kench’s bonus Health as magic damage. Active: Tahm Kench channels for up to 15 seconds. Throughout the duration, any allied Champion can click on Tahm Kench and be absorbed by him. Tahm Kench and his ally will then travel to target area on the map. If an enemy Champion deals damage to Tahm Kench during the channel, the spell will be interrupted. Tahm Kench can re-castÂ the spell during the channel to travel alone. Tahm Kench travels Runeterra’s waterways, feeding his insatiable appetite with the misery of the unsuspecting. The singularly charming gourmand savors every moment of his victims’ suffering. Â A deal with Two-Coats may carry you to wherever you wish, but your journey will most assuredly end in the depths of despair. Master Chef Tahm Kench will be available for 975 RP or together in a bundle with Tahm Kench for 1462 RP. For his recall, Chef Tahm stirs his stew and then swallows it whole, utencils included. Gentleman Gnar will be available for 975 RP. Gentleman Gnar has different recall animations depending on his form. While small, he chews on his clock; in megaÂ form, he rests on his cane. From left to right and top to bottom: CJ Entus , SKT T1, Sonic Boom Sbenu, SamsungÂ Galaxy, NaJin EmFire, KT Rolster, KOO Tigers, Jin AirÂ Green Wings, Longzhu Incredible Miracle and Rebels Anarchy. From left to right and top to bottom:Â AHQ eSports Club, Assassin Sniper, Flash Wolves, Logitech Snipers, Machi eSports, Midnight Sun eSports, Taipei Assassins and Hong Kong eSports. From left to right and top to bottom:Â Imperium Pro Team, Boba Marines, ZOTAC United, Team Proioxis, Impunity Legends, Thirsty Chinchillas, Go To Sleep and Wargods. [ Note ] Same changes apply to Seraphâ€™s Embrace on Dominion. New Passive: Your spells and abilities heal you for 15% of the damage dealt, calculated BEFORE your opponent’s resistances. 33% effect for AoE Spells. [ Note ] Looks like this change was implemented in an older patch and I missed it. [ Note ] The Devourer enchantment was recently reworked on the PBE and now transforms to “Sated Devourer” at 30 stacks. You can find a preview of Elderwood Bard HERE. 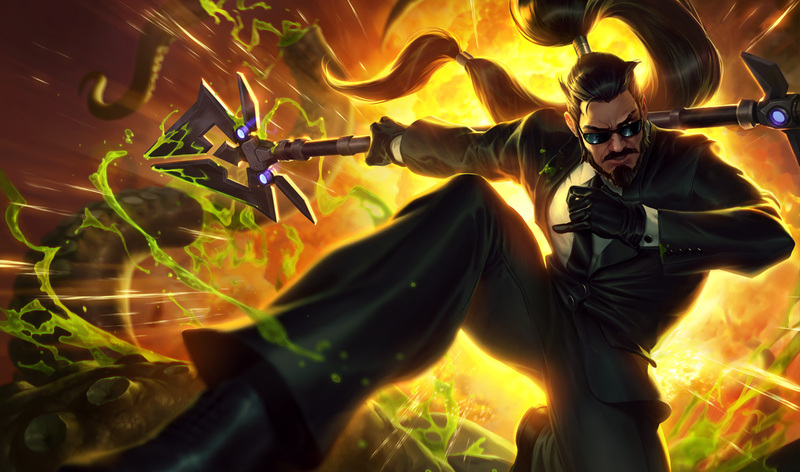 Get some early intel on Secret Agent XinÂ HERE. Luden’s Echo, the new 120 AP Item, has received its in-game icon. UNIQUE Passive: Gain charges upon moving or casting. At 100 charges, the next spell hit expends all charges to deal 100 (+0.15 AP) bonus magic damage to up to 4 targets hit. Luden’s Echo has a tooltip icon similar to the one of Statikk Shiv. At 100 charges, purple bolts come out of the spell’s first (or only) target and seek nearby enemies to hit. The recently-announcedÂ Mandrake Ward is now available for testing. Note, it may not be available for Patch 5.5. Click to Consume: Summons a sentry to run and burrow in target brush (within 1200 range) for 2 minutes. While burrowed, it becomes blind and invisible but will ping the map if a visible or invisible enemy is within 1000 range. The Mandrake Ward needs to target a brush. When cast, a small sapling walks towards the brush and plants itself, pinging once when an enemy walks into that brush, be it visible or invisible, and then disappears. If you don’t target a brush, you’ll receive an error message.